Most people will tell you that writing off home losses on a personal residence sale is impossible or not allowed, but they would be incorrect. Generally, the IRS tax code prohibits any deduction for a loss on the sale of a principal residence. However, it authorizes several exceptions for writing off home losses on a personal residence. For instance, the law allows a deduction for a loss from the sale of a personal residence that has been converted to rental property. But it limits the amount of the write-off. No deduction for any drop in value before you begin to rent. The starting point is the property's (1) adjusted basis at the time of conversion or (2) fair market value at the time of conversion, whichever is lower. After you have determined the lower of (1) or (2), increase that amount to reflect rental-period capital improvements that boost its value. Next, subtract rental-period deductions for depreciation. What you finally arrive at is the property's adjusted basis at the time of sale. When you sell, the cap on your loss deduction is the amount by which the at-the-time-of-sale basis exceeds the sales price. In a sour real estate market, the property's adjusted basis at the time of sale could be substantially lower than its original cost. As a general rule, the basis starts out as the original cost, including any debt assumed such as a first or second mortgage, plus adjustments up or down. Adjust upwards to reflect outlays for certain settlement or closing costs connected with the purchase such as legal fees and / or improvements. Adjust downwards for the amount of gain from the sale before May 7, 1997, of a previously owned home on which tax was postponed. All these adjustments of your original cost result in your adjusted basis. An example: In 2001, you buy your first personal residence for $200,000. In 2003, you move out of the house and rent it. At that time, you determine that its fair market value is $180,000. Subsequently, you take depreciation deductions of $20,000 and sell the property for $150,000. You might think that your loss is $50,000—the difference between the original cost of $200,000 and the sales price of $150,000. But the IRS limits your loss to just $10,000—the amount by which the $160,000 at-the-time-of-sale adjusted basis (fair market value of $180,000 at time of conversion minus rental-period depreciation of $20,000) exceeds the $150,000 sales price. When the rental period is for less than one year, the IRS might contend that a loss should be disallowed on the grounds that the seller's conversion of the residence to rental property was only temporary, not permanent. Its guidelines for home sellers warn that "you have not changed your home to rental property if you temporarily rent out your old home before selling it." However, the guidelines on what is temporary and what is permanent are by no means the last word. They merely reflect the official IRS position on an issue and are not binding on the courts. 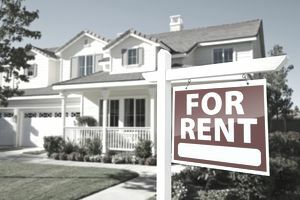 Nor, according to the guidelines, will the IRS consider a personal residence to have been converted to rental property "if you place your home with a real estate agent for rent or sale and it is not rented." Translation: You have to actually rent out the home before you can take a loss deduction. This limitation has been upheld by the courts. If in doubt, always check with a professional tax accountant or CPA before claiming home losses on a personal residence. Also, check with the IRS to make sure you comply with new tax laws, which change every year. Property taxes in some states such as California are now limited to a maximum deduction of $10,000 under Trump's 2018 tax law. Julian Block is a tax expert from Larchmont, New York. Edited by Elizabeth Weintraub, Home Buying Expert.